When Christmas productions come with a fair smattering of swear words, bags of suspicious white powder, and one very angry prostitute, you know it's not one to take the kids too. 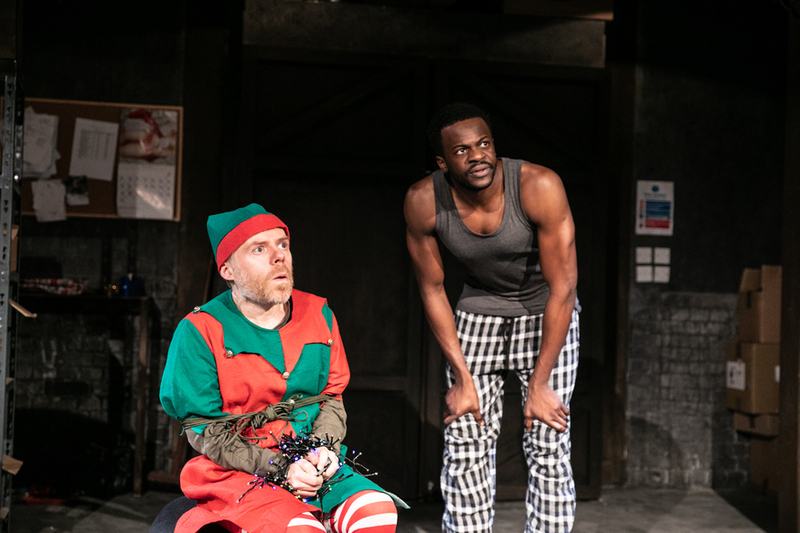 The Night Before Christmas at Southwark Playhouse should definitely come with an adult rating — the Christmas Eve in question, is a rather depressing one in lead character Gary's warehouse, far from glad tidings and figgy pudding territory. Picture Gary, a divorced dad trying his hardest to sell his knock-off toys so he can get his little boy a Power Ranger. Sound like a sob story? When Gary discovers an elf in his warehouse the evening takes a peculiar turn, and the hour-long play is anything but a cause for tears. Apart from (occasional) tears of laughter. Especially for the reveal that elves are junkies getting high on Christmas spirit, which weaves itself into the drama well; other parts feel a bit forced and repetitive. It's a rather simplistic story, but it's boosted by epic one-liners and great comedic timing. The star on the top of the tree has to be Dougie McMeekin, who plays Gary: his style echoes of James Corden, and he is one to watch out for. If you're after an alternative to the sickly-sweet festive shows, feel a tad Bah Humbug, or just want an enjoyable way to spend an hour before the Christmas panic sets in, The Night Before Christmas is worth seeing. If not, at least the production assures you that you'll have a better Christmas than Gary's.